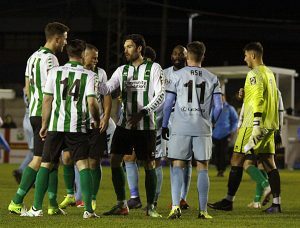 Blyth Spartans’ 14-game unbeaten run came to an end following a below-par display against Hereford. Croft Park stood to applaud captain Robbie Dale after he was honoured alongside Eddie Alder before kick-off – whose record he beat – to become the club’s all-time leading appearance holder at Bradford PA last week. Unfortunately, though, the home fans were quickly silenced as Hereford claimed an early lead through Owen-Evans after he raced past Nathan Buddle – slotting the ball beyond Peter Jameson. It was a shaky start for Blyth, however Spartans so nearly found an immediate equaliser. Connor Oliver delivered delicately into the box – Dan Maguire on the end of it only for Jordan Cullinane-Libburd to scoop it off the goal line. Blyth had briefly threatened a swift fight-back but Jamie Holmes’ clearance off the line from Richards’ in-swinging corner was the last real goalmouth action until the host upped the ante as we approached the break. The hosts’ golden opportunity fell to the unmarked Laing but he completely miscued his header. Then, Michael Liddle sent his free-kick into the side netting while Maguire attempted to catch out Yates at his near post. Spartans thought their opportunity arrived on the brink of half-time when Green looked to be fouled inside the area, though referee John Matthews deemed it to be right on the edge of the box. The resulting free-kick was taken by Dale but struck straight into the wall. If Laing should have scored, then Maguire’s chance on 46 minutes was a definite. Green the architect and with just Yates left to beat, the Blyth striker uncharacteristically fired over. A second goal-line clearance, this time from Harvey Smith via Buddle’s back post header, Blyth were made to pay for not capitalising on their early pressure just after the hour-mark. Buddle was let off the hook with loose back pass in which Mike Symons blasted over from 12 yards. However, it only delayed Blyth’s blushes as Oates produced a bullet header to beat the helpless Jameson. Adam Wrightson, on for Holmes, proved to be the hosts’ attacking vocal point when introduced, although he had no part to play when Green fired Spartans back into it with a long-range effort that went straight through Yates. With Blyth naturally committing extra bodies forward, only the left hand of Yates pushed Maguire’s goal-bound effort past the far post. And the visitors highlighted just how big of a moment that was – substitute Lloyd breaking away on the counter-attack, looping the ball over Jameson as he tried to close him down – four minutes from the final whistle. Spartans’ effort in the closing stages certainly couldn’t be faulted as Yates again stamped his authority with a superb save at his near post to deny Wrightson. And while he failed to stop Fewster from reducing the arrears, first striking the crossbar before directing home the rebound in the third minute on injury time, he helped inflict Blyth’s first defeat since November 3. Next up for Armstrong’s side is a difficult trip to National League table-toppers Leyton Orient in the FA Trophy last 16. Blyth: Jameson, Nicholson, Liddle, Green, Buddle, Laing, Holmes (Wrightson, 65), Oliver (Fewster, 65), Maguire, Reid, Dale ©. Subs not used: Mullen, Butler, Watson. Hereford: Yates, Thomas (Wharton, 45), Greenslade. Cullinane-Liburd (Finn, 72), Smith, Gowling, O’Sullivan (Lloyd, 63), Owen-Evans, Richards, Oates, Symons. Subs not used: Dielna, Roberts.